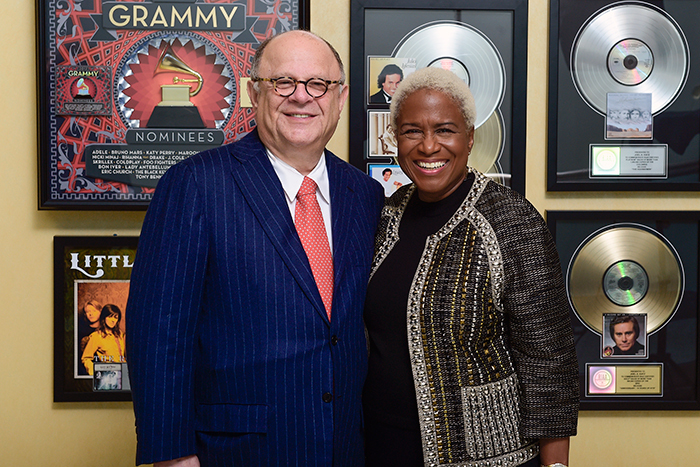 Joel Katz poses with former Atlanta television anchor Monica Pearson at the opening of the Joel A. Katz Music is Medicine Collection. Visiting Winship Cancer Institute on World Cancer Day, Katz said he hopes the exhibit of music memorabilia helps patients "be upbeat, lifted from care." 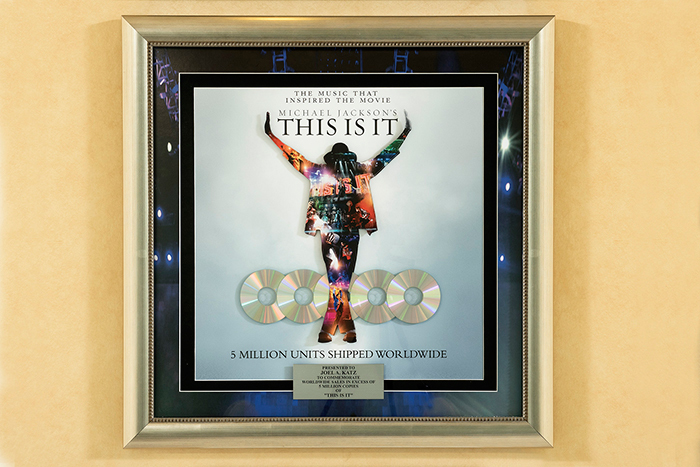 A commemoration of worldwide record sales for Michael Jackson is among the three-dozen items on view in the collection. Visitors to the exhibit will recognize many of their favorite music stars among the memorabilia in the Music is Medicine Collection. Located on the Tunnel Level of the Winship Cancer Institute, the exhibit is free and open to the public weekdays from 9 a.m. until 5 p.m.
On World Cancer Day, entertainment lawyer Joel Katz visited Winship Cancer Institute for the opening of the Joel A. Katz Music is Medicine Collection. A related fund will help support cancer research. Everyone hit pause on their conversations when Joel Katz stepped to the mic at Emory’s Winship Cancer Institute on Feb. 4, World Cancer Day. Katz — an Atlanta-based entertainment lawyer with his own Billboard ranking — was there to talk about a musical oasis he has created on Winship's Tunnel Level for the enjoyment of patients and families. The night’s festivities marked the opening of the Joel A. Katz Music Is Medicine Collection, a diverse assemblage of music memorabilia, and attracted Peach State celebrities including Lt. Gov. Casey Cagle and former television anchor Monica Pearson. 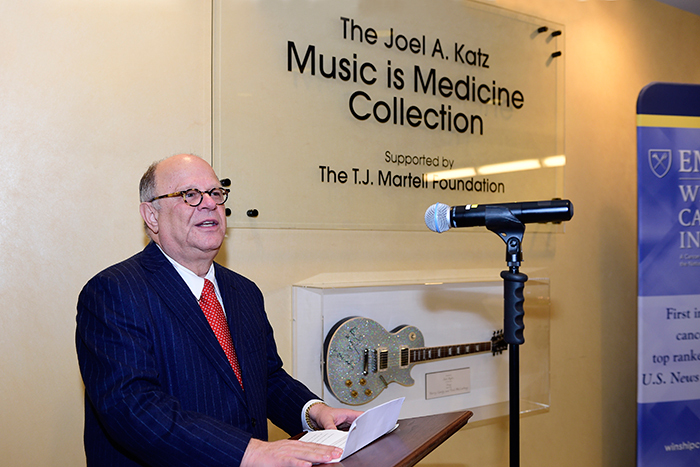 The gift of the collection coincides with the T. J. Martell Foundation’s establishment of the Joel A. Katz Music Is Medicine Fund, which supports innovative cancer research at Winship. And how could they not? 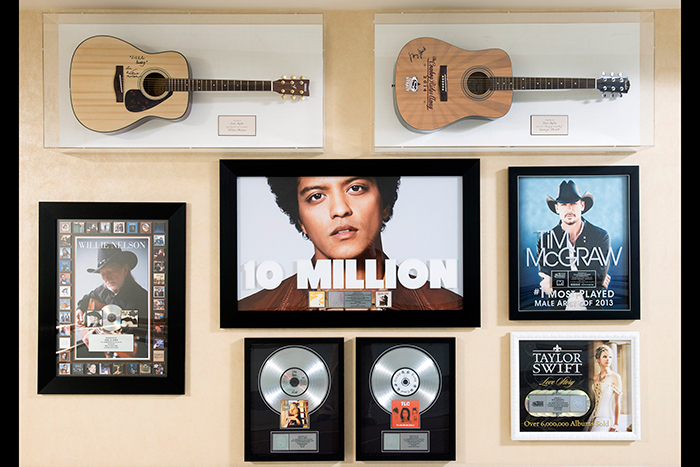 On view are three dozen items including multiplatinum commemorations of worldwide record sales for Michael Jackson and Taylor Swift; guitars signed by Paul McCartney, Willie Nelson and George Strait; and handwritten lyrics from Alan Jackson. Katz has crusaded against cancer for decades. He represented former CBS (now Sony Records) executive Tony Martell when he established the foundation named for his son, who died of leukemia at age 19. The only attorney to be elected to the Georgia Music Hall of Fame, Katz has fielded a crush of A-List clients after the Godfather of Soul, James Brown, sought him out to make a long-ago deal. At the time, Katz was a young lawyer who had opened what he terms a “tiny, tiny” office in Atlanta after leaving a position at the Department of Housing and Urban Development. He also was teaching at Georgia State, work that he enjoyed tremendously. One of his students was the friend of a friend of the Hardest Working Man in Show Business. The year was 1971, and Brown — in exchange for all that hard work — was negotiating a contract with his new record label, requesting a private jet and $5 million, among other things. Katz is known as the “dealmaker who thinks outside the box.” In talking to him, the respect he has for the artists he represents is evident. Beyond the individual deals he does for them, he assists artists’ groups, negotiating a 10-year agreement with ABC for the Country Music Association. Katz’s playlist? “It’s all over the place,” he says. Miles Davis, John Coltrane, Willie Nelson, Justin Timberlake, classical music. To the benefit of Winship patients, somewhere along the line they taught a lawyer to do the same. 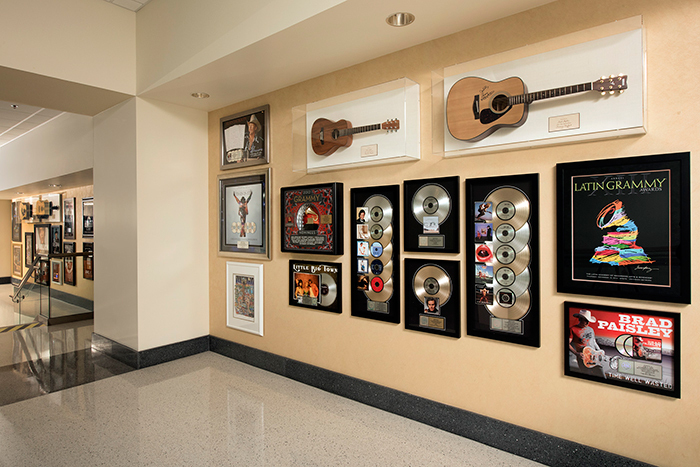 The Joel A. Katz Music Is Medicine Collection is located on the Tunnel Level of the Winship Cancer Institute. The exhibit is free and open to the public weekdays, 9 a.m. until 5 p.m. Don’t forget your earbuds.